Well, talk about crappy lighting this morning. It’s so gray outside and I don’t think my indoor lights made anything better so I apologize for the poor lighting today. I will make sure when I finish this page that I take a picture on a nice bright day. Today I am trying to continue to work on this page from Kerby Rosanes book’ “Fantomorphia“. This is the second page I aim to complete in this gorgeous coloring book. I am trying out another technique I learned on YouTube. I am using matte acrylic paint to cover the background. I painted it black. I think it makes the image pop. I learned that if you use acrylic paint that is matte, then you can color over them with colored pencils rather easily. So instead of having to take hours and hours using a black colored pencil coloring the background, I used a variety of sized brushes to apply the acrylic paint. It’s very fast and dries fast. I am now going over the little areas I missed or that were too small for my brush with my black colored pencils. 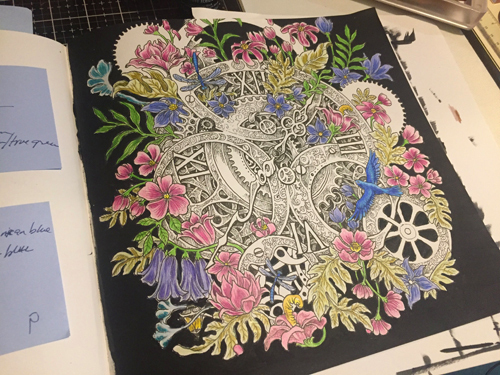 I plan on using my colored pencils to color the gears next and then I will either use my Wink of Stella over the top or try out another technique painting a coat of some of my Nuvo crystal drops. I want the gears to sparkle. On the right are my rulers, colored pencils and gel pens. I like using this little kitchen tray to hold colors I use in each project for easy access. You can also see the corner of a photo of some of my Hawaiian family and my family from our recent trip. 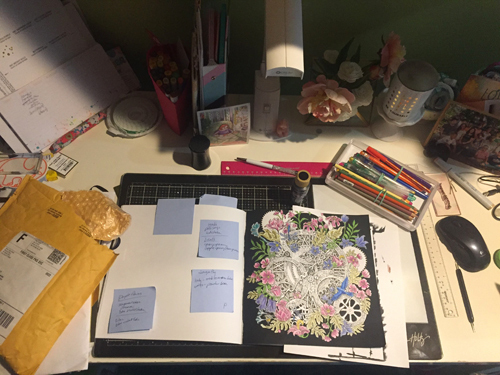 On the left of my desk, you can see a package that contains some new craft supplies I ordered from Simon Says Stamps. I purchased some dies and more Nuvo drops. You can also see some foam tape on the desk. I couldn’t find the one I had already purchased a long time ago. This, of course, is a side-effect of craft hoarding. I have a craft closet that holds many of my supplies. I think the door really should have police tape over it because it is quite dangerous to open the door without stuff falling out. Yup, it is in desperate need of cleaning. That is where I suspect my original foam tape is located. So, for now, it is in the crafting abyss. Well enough of my yapping, so I can come snoop on some desks. That is a GENIUS idea, painting the background black instead of lots of tedious colouring in with pencil. IT really makes the image stand out and so much better – I’m going to steal that if I may! YOur colouring is really amazing! I love the colouring! beautiful colours. thanks for taking time to look at the photos glad you enjoyed them. Hi Belinda. That work is simply stunning! Well done.